Must Read: Here’s How to run Ubuntu Linux on Windows 10. Also, the feature doesn’t share the actual password used to protect your Wi-Fi, but it does give your contacts access to your network. 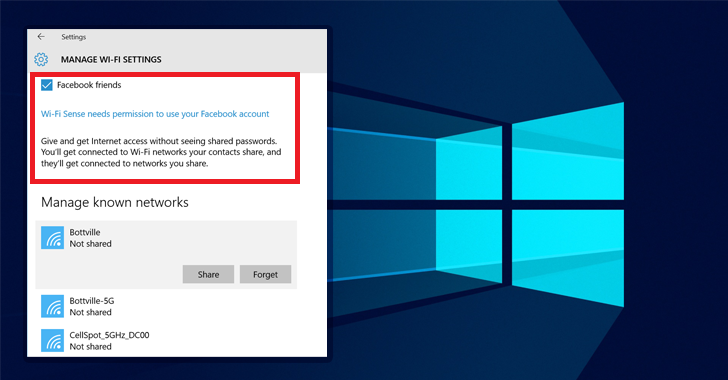 Since the feature doesn’t give you the option to share your network with selected individuals on Facebook, Skype or Outlook, anyone in your contact list with a malicious mind can perform Man-in-the-Middle (MITM) attacks. Although Microsoft defended Wi-Fi Sense network-sharing as a useful feature, Windows users did not give it a good response, making the company remove WiFi Sense’s contact sharing feature in its latest Windows 10 build 14342.